Your library card is the ticket to accessing thousands of digital books 24/7. Download fiction or non fiction to read or listen to on your computer, laptop, eReader, tablet, smartphone, or audio device. Ebooks and audiobooks items return themselves automatically at the end of the check out period and you can place a hold on any item not immediately available to check out. Click on the services below for step-by-step instructions and tutorials to walk you through the process. Stumped? Please contact us or stop by the library and our staff would be happy to help you get started. 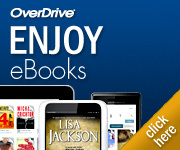 Downloadable books and audiobooks for adults, teens, and children. Watch, listen, and read at your computer to favorite and award-winning picture books and chapter books. Choose English, Spanish, or French. Not downloadable, but you can create an account and save your favorites.